It's just about that time when the sun is always shining and fashion matters the most. 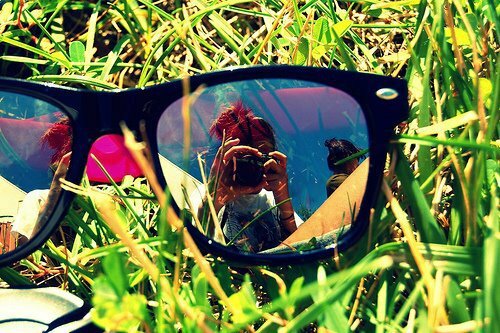 And though protecting our skin from ultraviolet rays this summer is important, so is protecting our eyes. But like with anything else, there's no reason why we can't be fashionable while we do it. Here are some stylish sunglasses you should consider checking out this season to not only protect your eyes, but your fashion credibility. Personally, I'm a big fan of the aviator shades, so I'm happy to know that sunglasses with gradient lenses are on trend for the summer. But to be honest, even if they weren’t, I would probably still wear them! Stylish and chic is the way I think of these particular shades. And they are most definitely versatile. Though this style is typically found on aviators, you can find it paired with a variety of different frames. No matter the season, designers are big fans of the gradient lens style, so finding this look in stores should be no problem. Because gradient lenses come in practically every style, this look can be a great catch for girls with oval or oblong faces. If you're a vintage junkie, you're going to appreciate the comeback of the retro cat eye shades. The best thing about this type of sunglasses is the fact they come in a variety of colors, decorations, thicknesses and sizes. They are perfect for laying out on the beach...all you need is a polka dot bikini! Because cat eye glasses have a particular angle, this frame looks best on those with round faces as the angular lines help add definition to your look. Born to be wild or just a fashion risk taker? Then this style is for you! Put a little avant garde in your wardrobe with weird shaped sunglasses, which are a fun throwback to the 90s and a page out of Elton John and John Lennon’s books. If you have a square face, circular shades do well to soften harsh angles typically accustomed to square and angular faces. Though you may be dying to get your hands on one of these shades, remember that just because we want something doesn't make it right for us. When picking out your sunglasses this season, you should figure out your face shape. There are five basic shapes: heart, triangular, oval, square and round. From here you should understand your complexion and facial features. If your nose is the most prominent feature on your face, you might have to forego the small frames you had your heart set on. But don’t worry, no matter which look you go for, you are sure to look your best this summer! That Gradient Lenses is perfect for my fashion sense. I also would like to say that Cat Eye shades is looking very feisty. It's almost empowering. I love that.